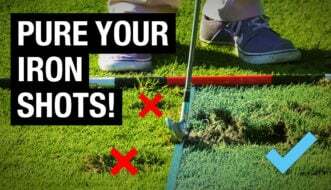 I want to discuss the impact position in golf. A lot of people try to swing back to the way they were at address, but in fact, the impact position is a lot different than you were at address. So, let’s take a look at those differences. When we set up to the golf ball, our hands are pretty much even with the ball. Sometimes, with an iron, they might be slightly ahead, but pretty much even with the ball. We make our swing, and if you come back right to that position, you’re going to end up hitting the shot heavy or thin. When you get to impact, your hips are going to be open, your chest is going to be open, along with your shoulders, and you’re going to see your left hand much more ahead of the golf ball. This is going to allow us to compress the golf ball and hit down. When I’m feeling this position here, my chest is pointing out in front of the golf ball, my left hip has moved away from the target line, and my right side has actually gotten closer to the target line. So, in this position, my chest is open, my left hip is pulled back, my right arm is lower than my left, right against my side, and I feel like I’ve got quite a bit of power. I can actually kind of press down into the ground and really feel that leverage. I think a lot of golfers get here, and they like to try to move up, and they’re really not compressing the golf ball like they should. I’ve had issues in my own golf game where I’ve gotten in the habit, at times, of sliding and kind of tilting my spine back. So, what I’ve done to try to help myself with that problem is get into this impact position – left hip back, left hand forward – and I actually start hitting shots from this position, just little small shots. I’ll start here, swing back, and just hit little shots. I’m really not trying to put the club in a certain position, I’m trying to feel that, what that impact feels like. So, I hit a lot of golf shots where I’m here, and my hips are open, shaft is forward, left hand is closer to the target, start from here, and hit shots. You can see I’m able to hit the ball first and really feel a good compression on the golf ball. So, after we’ve done this a few times, let’s increase the speed of the swing. Here, I’m back at impact. In the video, you can see, chest is open again, hip is open, and then from here, I’m going to make a slightly bigger swing, all the time not trying to necessarily get into those positions but feel the positions. I think it’s important because the golf swing is a motion, and I think just getting too focused on positions, we can disrupt that motion. 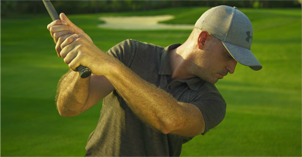 After that kind of practice, where we’re getting into our impact position, continue to increase the speed of our swing from here, and you start feeling exactly what you want to feel like in the golf swing.